"Anarcho"-capitalists are not seen as anarchists by any other strain of anarchism. While the left-leaning anarchists are notorious for engaging in heated debates amongst themselves, they are unequivocally united in the stand that "anarcho"-capitalism (or extreme neo-liberalism) will not create a free society. Another name for anarcho-capitalism is "individualist anarchism." They look at the Market as the sole ideal regulator of human society, and see the government as an unnecessary and expensive intrusion into the perfect mechanisms of the Market. This receives in Europe the epithet of ultra-liberal (remember that "liberal" in Europe does not mean the same as in the States). Sometimes the word "anarchist" is used to refer what in Europe we call "neo-liberal." As I understand, this term is misleading for US ears; the usual word is "libertarian," even if this is sometimes used for (a branch of) (socialist) anarchists. Note that I don't call the anacho-capitalists anarchists; I have never seen any them use any particular flag, by the way. We [anarcho-capitalists] are not as predisposed to flashy demonstrations and protests [as anarchists proper] so there has been less of a need to design visual propaganda like a flag. 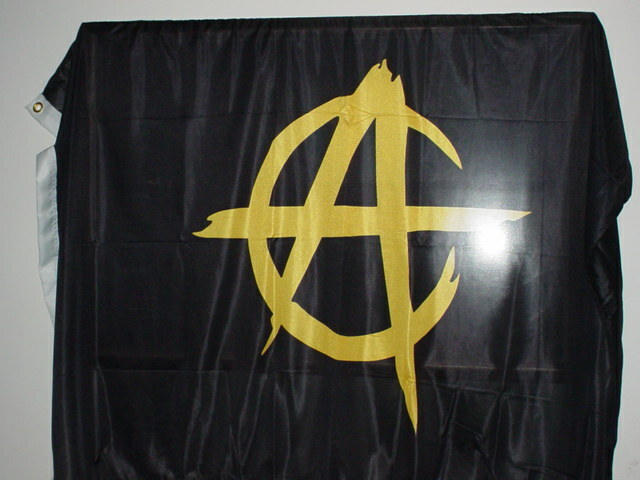 The gold-black flag of anarcho-capitalism seems to have been introduced by the Swedish Anarcho-Capitalist Front in 2002 or a bit earlier. 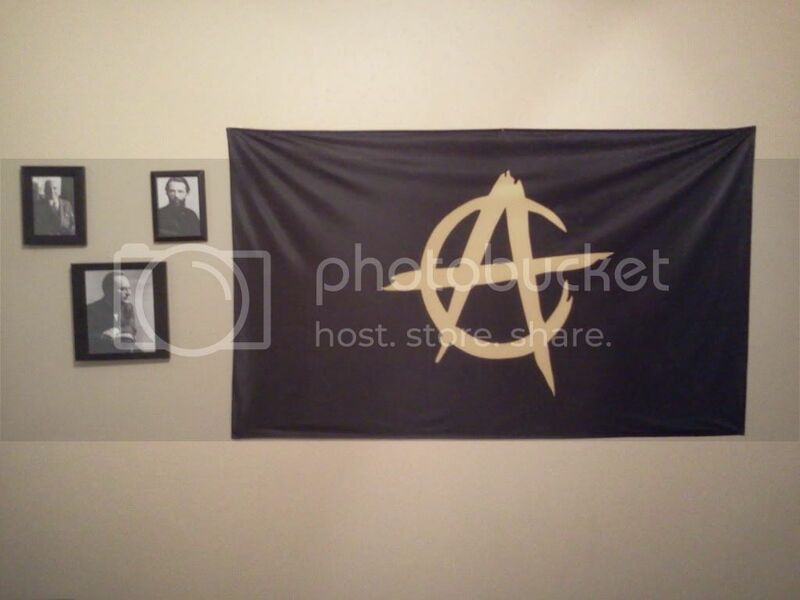 Since then, it has evolved into a general symbol of anarcho-capitalism, sometimes with additional charges, but the undifferenced design is also offered for sale online. The ratio may vary, but 2:3 seems to prevail. 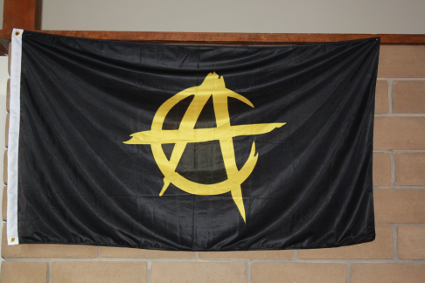 Another anarcho-capitalist flag is black, charged with golden letters A over C in center. The symbol is clearly derived from the anarchist symbol of the circle A. Several photos of this flag can be found here, here, here, and here. There is a symbol is called Libertatis Æquilibritas which combines the traditional anarchist Circle-A with the Yin-Yang and the familiar dollar sign. That is probably the more widely used anarcho-capitalist symbol. The Libertatis Æquilibritas was developed by Per Bylund. He talks about his symbol here.